Given that the Steam summer sale happened recently, I was able to snag some old classic favorites of mine for cheap. 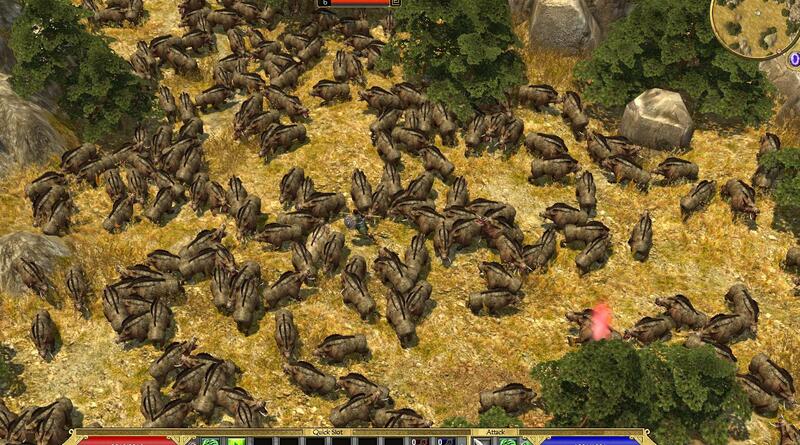 One of them being Titan Quest, which I played a lot when I was younger. I have been tinkering with the game bit to see what kind of new and interesting things I could come up with now compared to when I first played it as my game hacking and reverse engineering skills have greatly improved since then. That said, I will be keeping this topic updated with the latest and interesting things I come up with and make. I may release the Cheat Table sooner or later, I have not yet decided. I may hold onto it for other purposes as well such as a Patreon perk in the future or something to access some private things of mine for those interested in supporting my work. We'll see when that time comes though. This cheat table is for the Titan Quest Anniversary Edition which was released on Steam. The version of the game is current v1.43 as of this post. Note: Scripts that start with a (!) mean that they require the master code to be enabled to work properly! If a script is a child script of a parent that requires the master code, the child script will not work without it as well! Child scripts will be hidden until their parent script is enabled anyway. Cheats that require user input of some kind to use. Note: Cheats that start with a (!) mean that they require the master code to be enabled to work properly! Too many items to list here. This section of the cheat table has nearly 200 entries at this time. This includes nearly every bit of information contained in the main player pointer object, such as your health, stats, gold, world position, and so on. It includes some other information that can be useful to edit while playing that doesn't really warrant its own script. Like the player structure, too many items to list here and this is ever-changing so I'd rather not list everything here. Most of the structures are mapped out so the majority of any kind of info people would be interested in seeing is available. All of the debug information settings are available as well to turn on the internal tools of the game for debugging various things and seeing info for parts of the game and how it's working. (Threading, network info, rendering, etc.) I may mention specific bits of these structures at some point if I feel they are worth talking about though. Master Code - The master code obtains the main players pointer. This is needed for various parts of the cheat table to work properly. For this to work properly, enable the master cheat then alt+tab back into the game and allow a second or so to go by while the game is unpaused. The Player Pointer and Player Id should populate with information when the pointer has been obtained. Teleport To Mouse Position [Press ~ to teleport to your cursor position.] - Teleports you to your mouse position when you press the ~ buttton. (Tilde, next to 1.) This cheat constantly records your mouse position in 3D world coords and then forces your personal position to it when the button is pressed. Note: You cannot teleport while moving, you must be standing still in order to teleport. Teleport (Save / Load Position) [F9: Save, F10: Load] - Allows you to save and load a teleport point wherever and whenever you want. Simply activate the cheat, then press F9 to save your current position. Afterward, press F10 to teleport back to that spot whenever you want. Force-Refresh Player Stats - Useful for when you edit your stats and need to revert them back to normal. This will force the game to recalculate your stats back to normal. To use this script, you must first enable and then disable it. Once it is disabled, it should have worked properly and your stats should be recalculated. Quick Exp Gain - When this cheat is enabled, an editable multiplier will be shown. You can adjust the amount of all experience points gained is multiplied by. This means that if you get 100 exp, and you set the multiplier to 2, you will get 200 exp instead. Increased Movement Speed (250%) - Sets the players movement stats to be that of 250% increased movement speed by force. Other gear that alters your movement speed may not properly be included into the speed and be ignored while this is activated. When you deactivate this cheat you may need to use the 'Force-Refresh Player Stats' option to properly reset your speed. No Item / Skill Cooldowns - Removes cooldowns on both items in your inventory / equipped items, as well as your skills allowing you to use them as often as you wish. Potions Stack To 999,999,999 - Stacks potions to 999,999,999, although I do not recommend going this high. The higher you have, the laggier the game will become due to how items are handled and stored on disk. You will begin to notice really slow menu response times and delays trying to talk to NPCs, use items/skills, and so on. Ignore Equipment Requirements - Allows you to wear any piece of gear regardless of its requirements. Bypasses the STR/DEX/INT and level requirements of all equipment. This also ignores the requirements to use relic enchantment items. Artifacts Do Not Require Reagents - Removes the reagent costs to crafting artifacts. They will still require the gold amount needed, but all of the materials otherwise will not be consumed and will not be required. The game will assume you have 999 of any of the ingredients that you need. Filter Out Yellow Items (Press X) - Overrides the item filter handler when pressing 'X'. Force filters out yellow items to make it easier to see green and higher qualities. Custom Item Filter [Filter Everything!] - This is a full item filter override. This allows you to filter every single item type in the game one by one up to you. This can be extremely useful of speed farming runs that you want to quickly and only pick up certain items such as Legendaries. No Broken Item Drops [Works best if enabled at main menu screen!] - Removes broken items from dropping at all while playing. This works best if you enable it while you are at the main menu screen / character selection screen. If you load this after you are already in game, then any monster within range of you will still have a chance of dropping greys. You will need to go a few screen lengths away to begin getting monsters that load on the fly and will stop dropping greys. Monsters Drop More Items (They equip more things, making them harder.) - This forces monsters to have a higher chance of equipping more items such as earrings and so on. Because of this, they do gain the stats of those items and can increase how hard they are. Be mindful of that when turning this cheat on! Increased Unique Chance / Drop Rates (Monsters) + (Chests) - These cheats increases the drop rates of monsters and chests causing yellow and higher item qualities to drop more often. Override Chest Item Count - Allows you to alter how many items will drop from a chest. Use with caution, high amounts of items can cause the game to lag out and crash. I do not recommend going over 1000 items otherwise you risk crashing opening things. This also works on other containers such as bone piles, chests, wreckage, etc. Always Show Item Prefix/Suffix Names - Force shows the generally hidden prefix and suffix's of items. Always Show Combat Numbers - Force shows your combat numbers all the time. For this cheat to work, you must enable the 'Show Critical Damage Numbers' option in the game options. Show Pet Combat Numbers - Allows you to also show your pets combat numbers. Show Anger Levels - Force enables a debug window to open in-game that contains the current anger list of enemies around you and that are attacking. Shrine Buffs Last Forever - This causes buffs gained for shrines and other sources to last forever. This also includes debuffs though. So you will need to use with caution. If you get a debuff you can disable this cheat until the debuff wears off then quickly turn it back on and keep your buffs without losing them. Unlock Locked Items / Doors [Use carefully, can bug the story line!] - Allows you to open locked chests and doors without meeting any of the requirements to do so. This can be useful for speed farming the Secret Passage or similar Legendary runs. However, because this can let you bypass parts of the main storyline without doing any of the quests, I recommend you use with caution because you can potentially break the main story line! Duplicate Items When Dropped [Stacks will dupe only +1 of the stacked items.] - This causes any item you drop to drop twice, effectively duping the item you dropped. If the item is stacked, it will only drop one of the stacked items. For example, if you drop 25 health potions, it will drop 25 + 1 and not two stacks of 25. Use Relics + Charms On Epic/Legendary Items - Allows you to use relics and charms on blue and purple items which normally cannot use them. The game will still warn you that you cannot do it but after clicking ok it will still work. Use Relics + Charms On Any Item Regardless of Slot - Allows you to use a relic or charm on any type of gear regardless of the slot it is meant for. For example, if you have a relic that is used on shields only, with this cheat you can put it on a helmet instead. Make Relics + Charms Universal [Combine any together.] - This allows you to combine any type of relic or charm together to increase the level of the target charm or relic. Disable Fog Of War - Completely removes fog of war textures from being rendered leaving the greyscale map only to be shown. I do not recommend using this always, enable it just when needed then disable it before moving around or closing the game etc. This can cause memory leaks as it makes the game think that no texture is created for the current region. Super Fog Of War Clearing - Enhances the distance in which fog of war is cleared. Instead of being a small circle around you, it now clears the entire current region you are in when close to it. Skill Cheats - Give All Skills (Max Level) - This cheat forces the game to give you every single skill in the game and maxes its level to the highest it can be as if you spent the points to unlock it. In order for this to work fully you need to do the following: Go in game, enable the cheat and then open the skill tree menu to see if it worked. Once you confirm it worked, disable the cheat, then exit to the main menu and reselect your character again to make a new game. You must leave and reenter the game after using the cheat to be able to select any of the skills and use them. Skill Cheats - Reset All Skills - Resets all skills to 0, by force. This does not give you back the skill points you spent! Set Custom Spawn Rates - Lets you alter the games spawn rate (globally) for all monsters. (Warning, setting these too high will crash the game. I do not recommend going over 10.) I also recommend enabling this at the main menu and altering the values to your desire then, before entering the game for best results. - Fixed issue with infinite health not always calculating the proper total health if you had any hp% stats on gear. - Fixed issue with infinite mana not always calculating the proper total mana if you had any energy% stats on gear. - Mapped out most of GAME::gEngine structure. - Mapped out most of GAME::gGameEngine structure. - Completely redid first post. - Recoded all cheats in the table to be cleaner and better optimized. - Reorganized the cheat table overall. - Increased potion stack size script. - Tons of new cheat scripts added. - Remapped nearly all of the Player structure. - New cheats made and posted to main post. - Some old cheats tweaked. - More object structure mapping done. - Initial post created, main cheat information posted. Finished tonight off by mapping out the GAME::gEngine object structure. Most of it is mapped out now minus a few parts of it that are not referenced in a straight forward manner. I didn't have time to debug every single address in it. I gathered the more or less important information needed and other things that were easily determined. I have GAME::gGameEngine mostly mapped out as well, with some parts of it I want to look into a little further. But for the most part, these two structures mapped out so far have most of the important info. Over the next week or so I have a few more script ideas in mind, then I will probably be looking to begin working on a Patreon page and seeing how I want to handle releasing things like this. Various new cheats have been added to the table over the last week. I've reorganized the main posts, and updated the changelog with the new cheats. New cheats and bugfixes added! Check the changelog for more info. This was with 100/100 values. (min/max respectively) However, going this high crashes the game very easily due to too many objects.